This has been a banner week for conspiracy theorists, conservative and liberal alike. The liberal foofaraw was over a mysterious white object that Romney had on him during the debate that may or may not have been a cheat sheet. It resembles the theory that George W. Bush was wearing a wire during his debate against John Kerry in 2004. 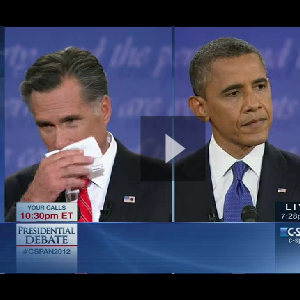 The Romney campaign said it was just a handkerchief, and seeing as how he used it to wipe his face during the debate, the case is probably closed.